Young Animator Training Project #3 | It can't be helped. I appreciated the sentimental value and the heartwarming flavor that’s prevalent in Tansu, don’t get me wrong. I find that most anime excel at telling those kinds of stories–stuff that’s really easy to digest at first glance, yet having a poignant bite hidden somewhere beneath it. Like fables of old with moralistic twists to keep the readers on their toes. The anime itself was smooth, consistent and relaxingly slow. Nothing wrong with that. 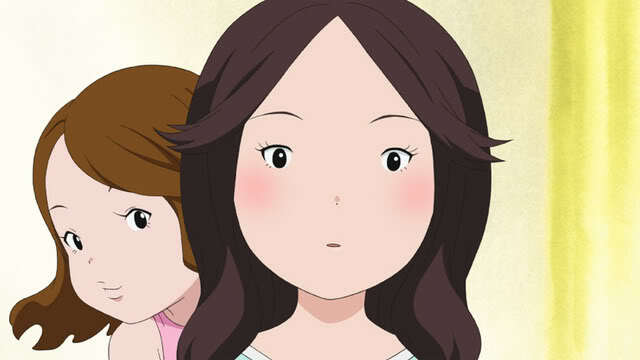 Tansu Warashi is, I feel, an example of anime at its simplest. There are no grand trappings, no frills, no exaggerated hooks–it’s just a wonderful and sentimental story with bits and pieces of imagination and fantasy that has a simple life lesson at its core. But still, I don’t feel it stands well enough on its own when you consider that it is a part of something like the YATP. Even more so when you put it side by side with the preceding two shorts–Ojisan no Lamp, and most especially the magical Kizuna Ichigeki. I felt it was quite hollow, and could have used even a little more spring in its step. It’s even lighter than Ojisan, which is saying a lot. The designs are much simpler; the art is flatter, and the animation is less movemented. It relied more on the composition and presentation to get its story across-which again is fine, that’s how anime rolls, after all. Superimposed on muted pastel-colored backgrounds are the characters who themselves are flat and muted. Not much in the way of detail-heavy and pretty drawings here, either. I got the sense while watching the ep that this was anime at its most fundamental, where the simplest of drawings and the simplest of presentations are combined to produce an entertaining whole. If the purpose of this short was to ground the younger staff on the slower side of anime and teach them the ropes, then I guess it’s done its job. But still, I wasn’t too impressed. Tansu just felt too safe of a film. Not much ambition to really propel the YATP forward. Still, there is something to enjoy here for everyone. My gripes for this anime are all based heavily on personal preference, after all. You have a lighthearted story about a girl learning to live her life more responsibly thanks to the help of little creatures living inside a big old-fashioned wardrobe. An all-ages anime that’s decidedly all-ages, in that it doesn’t drown itself in overblown theatrics and exaggerated hysterics. It’s a slow-burn film that’s well-suited for people who just want to sit back on their couches and relax. Not to mention you get some relevant values taught to you by the end. The designs are friendly, easy on the eyes. There is a sense of delight to be had when watching Tansu, much in the same way as most all-ages anime are. Even the protagonist is a twenty-something OL, which you really don’t see much in everyday TV anime. But that’s just it. I can’t believe I’m saying this, but it’s just too laid-back for me to fully enjoy. There’s just a lack of an underlying hook that grabs the attention and doesn’t let go. Even Ojisan, with all its overblown theatrical drama, had a lot more juice than this. With other films, there’s at least a convincing and entertaining build-up leading up to the end of the event. I can’t help but come away with the feeling that it just doesn’t possess enough life, and that there’s hardly anything interesting going on as I sat down and watched it. Maybe that’s just it. It didn’t seem to me like it was that much in tune with the ambition supposedly aimed at by the entire YATP. Production IG/Kise played this one really safely. I don’t think there’s anything blatantly wrong with Tansu Warashi. It’s entertaining and delightful enough, and it shows the most pared down side of anime, where everything is simple, whimsical, and lyrical. But to me it just didn’t have enough of the vitality and the sense of youthful vigor of the prior two YATP offerings, most particularly Kizuna. That ep, to me, just encapsulates the spirit of the animation project–vibrant, exuberant and lively animation all held together in an incredibly fun whole. It’s the episode that stands heads-and-shoulders above the rest, in my mind. That said, at least Tansu gave a breath of diversity and a view into the other end of the spectrum. I quite enjoyed myself watching the episode, but just came away feeling a little disappointed. The last offering in the YATP is PA Works’ Ninninman, and I’m curious as to how it goes. It looks fun from what I’ve seen of it. I actually got mixed up there and thought Ninninman was IG’s contribution to the initiative before. Funny how that works.